Under the Motor Vehicles Act, 1988, it is mandatory to have at least a third-party liability policy for any two-wheeler. There are a number of insurance providers offering adequate coverage at affordable premiums in Faridabad. Motor insurance is a smart investment to make because the risk of accidents on Indian roads is very high. The number of two-wheelers plying the roads has drastically increased over the past few decades and the numbers are ever-increasing. Finding the ideal policy will depend on your requirements, the coverage you want and the premium you are willing to pay. With so many insurance providers in the country, choosing the best insurance policy can be a daunting task. 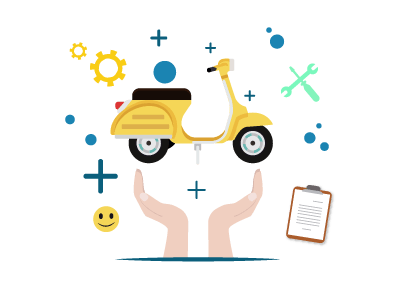 Some of the popular insurance companies in Faridabad that offer two-wheeler insurance have been listed below. The customer care service will be able to provide assistance in finding a cashless network garage. In the welcome kit or policy document, there should be a list of cashless network garages. On the official website of the insurance provider, there will be an option to locate a cashless network garage. Simply enter your location to find garages nearby. The main feature of cashless garages is direct settlement of insurance claims between the insurance company and the garage. Apart from this, customers can benefit from a number of other features of cashless garages in Faridabad. Hassle-free process - The customer can contact the insurance company through the customer care. Once the claim is approved, the garage and the insurer will handle the rest between themselves. The customer is not required to visit a branch to collect the reimbursement. Less expenses for the customer - With direct settlement facility, the out-of-pocket expenses to be borne by the customer reduces significantly. The customer is required to pay only for expenses not covered under the insurance plan. Type of coverage - Customers can choose from two types of two-wheeler insurance: liability-only policy or a comprehensive package. Comprehensive cover includes expenses incurred in damage to self and own property as well as third-party liabilities. A liability-only policy the basic legal requirement of insurance for every two-wheeler. This type of policy covers only expenses incurred in third-party damages to people or property. Plan cost - The cost of the plan is the premium that has to be paid in order to commence risk cover. Premiums depend on the city of registration and purchase, the make and model of the bike, the cubic capacity, the details of the driver and so on. Deductibles - Deductibles means the portion of the bill that you are willing to pay in case of a claim. The two-wheeler insurance provider will pay for the rest of the bill. Choosing a lower deductible will increase your premium, but when it comes to making a claim, the insurance company will be liable to pay for a larger portion of the bill. Choosing a higher deductible will reduce your premium, but in case of a claim, you will have to pay a higher amount. Cashless claims - Cashless claims settlements save a lot of time, reduce the hassle and out-of-pocket expenses. If your insurance provider offers cashless settlements, you will not be required to pay from your own pocket for the repairs. Reimbursement claims require you to pay the entire bill and later submit documents and bills to the insurer and collect a refund. Limits on claims - Insurance providers usually have limits on the amount you can claim in the event of an accident. Under comprehensive plans, the caps are dependent on the sum assured, premiums paid and coverage selected. For death caused to a third party, there is usually no limit. For claims on damage to third-party property, the insurance amount is capped at Rs.1 lakh. Exclusions - Insurance plans usually have exclusions under which the insurer will not be liable to pay any claims. Some of the common exclusions of two-wheeler insurance plans are driving under the influence of alcohol or drugs, driving without a valid licence, damage due to war, terrorism or nuclear-related incidents, gross negligence in case of theft, consequential losses and so on. Contact your insurance provider via the customer care or visit the branch/agent. Inform them that you are selling the bike and place a request to transfer the plan to the new owner. Once the new owner provides the details and documents required, the company will transfer the policy name to the new owner. You can apply for an NCB certificate if you have accumulated a no-claim bonus on your policy. The bonus will remain in your name as it is not transferrable to another person. If you buy a new insurance policy on a different vehicle, you can avail the NCB from your old policy. When selling your vehicle, there is a legal process to follow. Ensure that the name is transferred to the new owner so that you are not connected to any future liabilities that may arise in connection with the bike. To transfer the name, you need to visit the Regional Transport Authority (RTO). You need to inform them of the sale of the vehicle and apply for a No Objection Certificate (NOC).